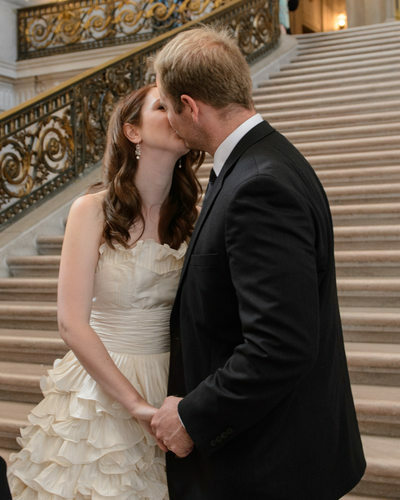 This fantastic couple wanted us to highlight the incredible architecture at San Francisco City Hall after we recorded their ceremony memories. 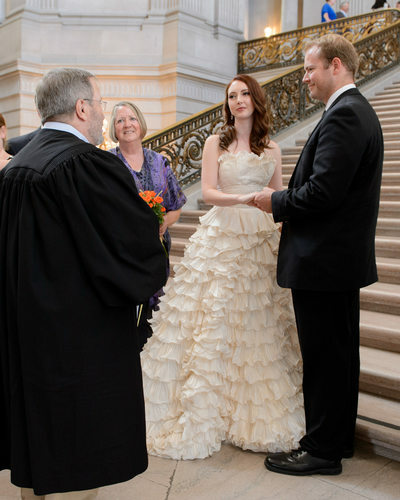 The location of this particular city hall ceremony was somewhat unusual because it actually took place right on the Grand Staircase. This Marriage Commissioner likes doing weddings there for reasons I am uncertain of. It works out fine unless its a crowded day with tourists who often hang out on the Staircase. 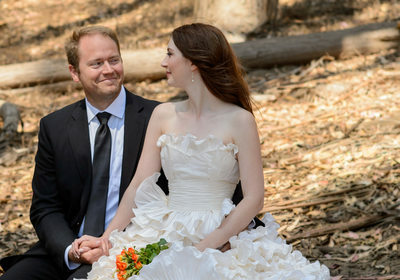 The few times we have worked at weddings with this officiant we have had our share of people in the way. This wedding was different, we were able to get all of the shots we wanted and nobody stood in our way. 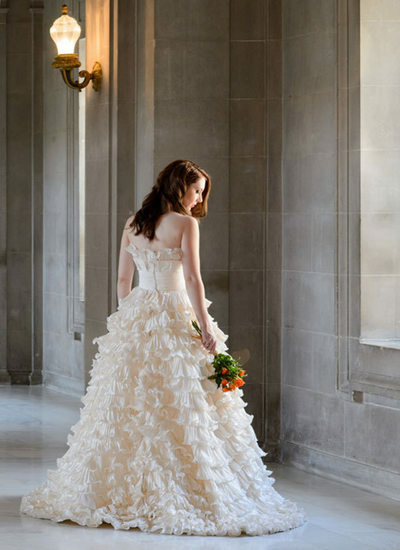 Tourists and other wedding participants mostly respected our space and steered clear. These newlyweds were definitely interested in obtaining some wonderful architectural images during our photo session around city hall. 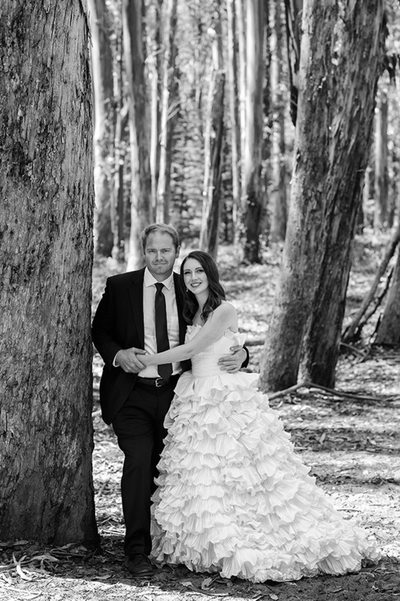 We always focus on the backgrounds, but for this couple we put even more emphasis on providing them with incredible images which featured both Architecture and backgrounds. 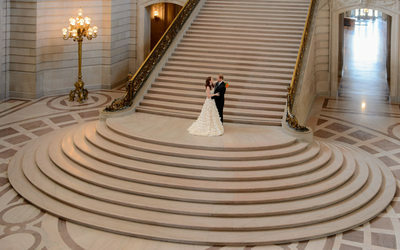 Our style of city hall wedding photography is always geared more towards showing the building. 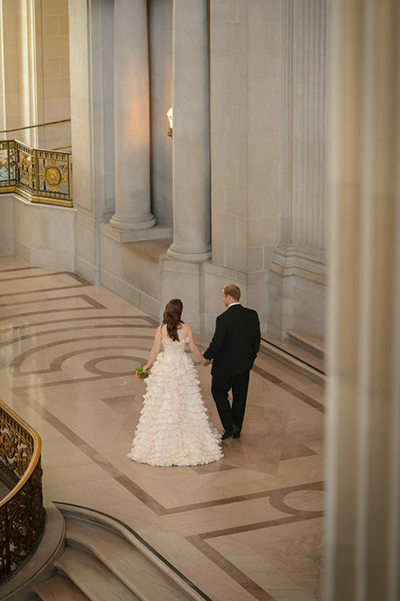 Obviously, the newlyweds need to be prominently featured as well, but I sometime wonder when I look at other photography in this building. Much of it seems to be more of the typical tight portrait shots with blurred backgrounds. Classic portrait photography involves featuring the subject and then blurring out the background to separate them and make them stand out. This is fine and effective, but it can be overdone at San Francisco City Hall. I mean, why would you want to blur out all of this beauty and history. I think a happy medium is possible by providing our clients with both. Some nice portrait image with nice bokah backgrounds and then some wide angle images where virtually everything is in focus. 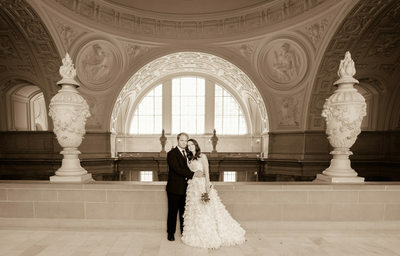 We are often asked by our brides and grooms how they should prepare for a city hall wedding photography shoot. Though no specific preparation is really necessary, there are few things that can be done to make things go smoother. I always tell my brides to practice their smile in the mirror, not so much for me, but for them. The one complaint that you often hear from photo models is that they don't think their own smile seems natural. Sometimes during the photo session itself, the bride's mom will tell her daughter that her smile does not look natural (not helpful). This may or may not be true, but it may be worth the extra trouble to check out your own smile and make sure you like what you see. The other thing that I think is more important than any of this is just relaxing. Toni and I do the best we can to keep our photo subjects at ease. There is nothing really to be nervous about and we never ask our clients to do anything that would be uncomfortable or awkward. Having a good pre-photography discussion with the couple is also very helpful. This give the bride and groom the opportunity to let us know what they don't want us to ask them to do! 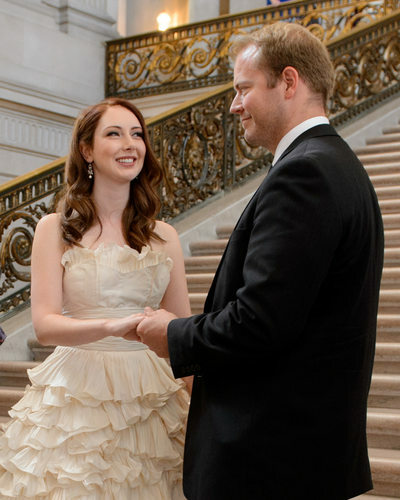 After we took the happy couple around the building, we drove them to a place in the San Francisco Presidio called Woodline. It's a unique location with lots of trees and shade. We like to come here on windy days because the trees help block some of the wind and there exists a ton of privacy. The name Woodline comes from the long line of fallen trees that you see in some of the photography. Classic photography tells us that depth is a very good thing in award winning images. Well, if that is the case, then Woodline is the perfect place to take professional wedding pictures. Check out the images above to see what we are talking about.